There has been a great deal of discussion about the often romanticized role men have played and continue to play with regard to tea, but much less has been said about women in tea. Women contribute a significant portion of the labor in the tea picking process, enduring difficult and often dangerous conditions to obtain the best leaves and buds. They carry heavy sacks filled with tea slung over their heads and down their back while facing the real possibility of encountering an assortment of venomous snakes, angry elephants and vicious foxes as part of their daily routine. It is not a job for the faint of heart. It is also not a job that is chosen by many. Women enter or are coerced into the tea workforce at a young age, often delaying or forgoing educational opportunities in order to contribute financially to their families. The short-term gains are meager (around $2/day) and the long term costs devastating, as many women find themselves trapped in a vicious cycle on tea plantations. 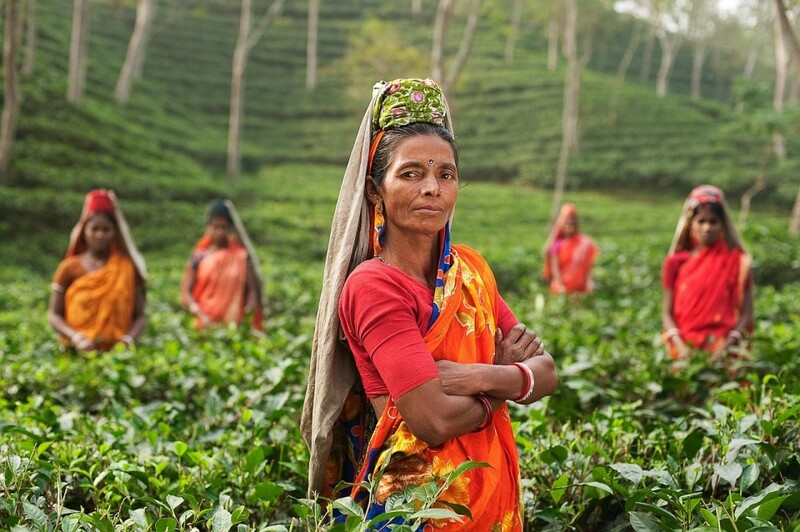 Just over half the tea pickers are women. They work longer hours on the plantations than men but they do not have access to union positions. Unable to afford adequate food, many women are poorly nourished and their babies are low-weight. Citing her own work on the subject, Chatterjee discusses how women’s bodies – as workers and as consumers – mark this journey of global trade in the most indelible ways. There have been efforts to enfranchise women on some plantations, though. In Darjeeling, a plantation manager mentions that he gives money directly to the women of the household, since they know how to manage it better, and how to use it to educate their children. He sees empowering women as a long term investment in the community, enticing skilled laborers to stay in their positions by creating a sense of autonomy and agency. Empowering the women in their communities is a great first step. Recognizing just how much skill these women show would be another great step. They demonstrate a combination of impressive strength, stamina, manual dexterity, and a bit of fearlessness every day they are in the field. Orthodox tea production is truly an artisanal craft at every step of the process. The leaves have to be picked by hand, with a gesture that takes time to master. The withering and oxidzing has to be timely, and much of the knowledge is visceral, only learned through smell and touch. Incorrect processing can easily ruin good tea, wasting all the effort. It is not unskilled labor by any means, despite the ridiculously low wages tea laborers earn. Perhaps there needs to be some sort of market shift, so that the profits that accompany the re-selling of tea to the consumer can actually trickle down to the people who do backbreaking work to create an outstanding product. Whatever the solution, it can’t come fast enough. With Labor Day just around the corner, though, I wanted to take a moment to be appreciative and mindful of the people who labor under such difficult conditions to bring us the wonder and joy in every cup of tea.